Though not a great film, I’ve always rather enjoyed Laurence Harvey’s final movie ‘Welcome to Arrow Beach’, a creepy little chiller with a cannibal twist. It’s not very well made and the editing is choppy, but it has a degree of atmosphere and seriousness about it that has endeared it to a small crowd of genre buffs over the last few decades. Also known as ‘Tender Flesh’, this was hardly a fitting swansong to Laurence Harvey’s interesting career, and a strange choice for his only directing effort. Though not a great actor, he was perfect as the ambitious Joe Lampton in ‘Room at the Top’ (’58) and as a brainwashed POW in ‘The Manchurian Candidate’ (’62). 25 year old Meg Foster had earlier played a young hitchhiker in the cult drama ‘Thumb Tripping’ (’72), though I remember her most as Rutger Hauer’s crossbow-wielding wife in Sam Peckinpah’s final film ‘The Osterman Weekend’ (’83). As the sheriff and his deputy, reliable veterans John Ireland and Stuart Whitman slum it throughout, while the lovely Joanna Pettet has little to do as Harvey’s sympathetic sister. While there are some mildly gory moments, it’s static feel and lack of excitement will ultimately put many off. 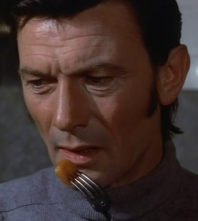 It didn’t help matters that Laurence Harvey was so ill at the time that he had to do the editing from his deathbed (he died that year from stomach cancer aged just 45). Also, any anti-drug message here will be lost on most, who will probably be bored by the lack of action in the proceedings. A sloppy but occasionally interesting sleeper, ‘Welcome to Arrow Beach’ is not for all tastes (no pun intended! ), but with its professional cast and intriguing storyline, it almost manages to rise above a lot of other horror fair of its day.